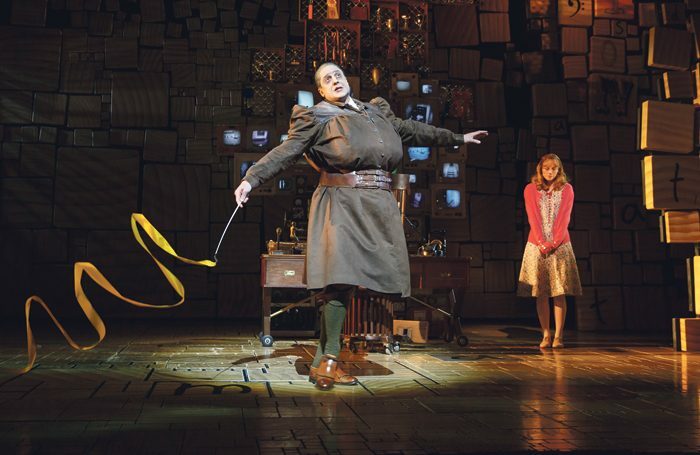 Matilda tops tours – but where are the other musicals? With the UK Theatre Touring Symposium coming up on March 23, I thought it would be a good time to explore some more of Arts Council England’s open data. Previously for The Stage, I have analysed data from national portfolio organisations, but the Arts Council also releases raw data submitted by funded organisations that tour, which includes NPOs and organisations funded by Grants for the Arts and Strategic Touring. This includes touring by any organisation supported by English national, public funding (whether from the Treasury or the National Lottery). The great thing about open data is that anyone with the time and inclination can explore it at no cost. What ACE publishes is rather old (the most recent release in October 2016 was for 2014-15) but the level of detail is impressive. Performance information is provided for every tour by every organisation to every individual venue – more than 10,000 entries in 2014-15. Less impressive is the quality of some of the data. As with the NPO data, there seems to be inconsistency in approach to completing the forms, which makes the cumulative figures for ticket sales and attendance look very odd. Some fields are populated with the wrong data (“SW2” is not a country) and there is little consistency in naming conventions (for example: US versus USA or United States). There’s also duplication and double counting: Betty Blue Eyes was submitted by a bewildering number of different co-producers, all providing slightly different figures (probably giving the total for the tour excluding their home venue). After cleaning up the data, I have focused on potential and actual box office income for UK tours, which has been completed consistently by organisations. In the first table opposite, I have included each co-production once, using figures provided by the co-producer that reported the highest box office income. Two final caveats: these are figures for tours and organisations supported by ACE funding. It does not include commercial tours. Also, the Arts Council’s definition of ‘tour’ includes productions that originate in one location and move to another. That means that what might normally be thought of as a West End transfer counts as a ‘tour’. 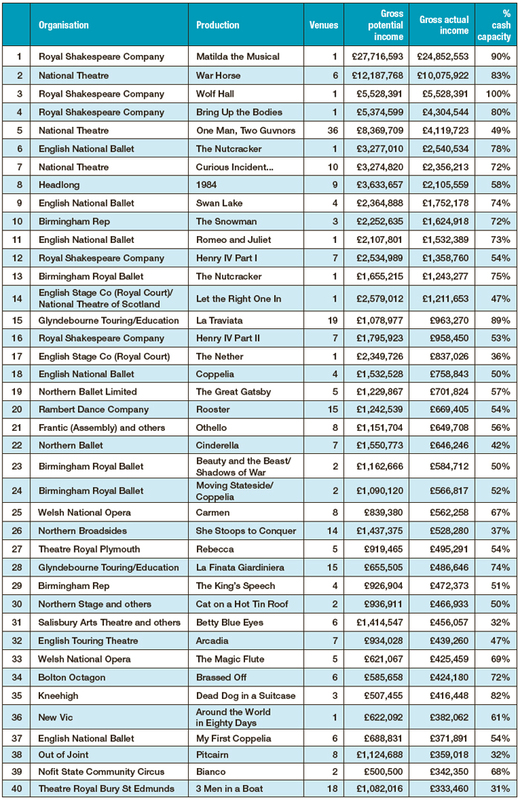 Many of the top 40 shows (and almost all the top 10) partially or totally achieve their position thanks to a West End transfer from the subsidised sector. The Royal Shakespeare Company has three of the top five shows, but all of these were produced in London. The National had three productions (War Horse, Curious Incident and One Man, Two Guvnors) that were both on the road and in the West End. The top four shows all did tremendous business, achieving over 80% of financial potential. According to the ACE figures, Wolf Hall achieved a hard-to-believe 100% of cash capacity. In all, 14 shows took more than £1 million, but the phenomenal success of Matilda (£25 million) and War Horse (£10 million) puts them in a different league. Further down the table, there is a striking number of dance productions: 11 of the top 40. Opera also has four entries. Excluding Matilda, musicals are virtually absent from the list. This would not be the case if we were ranking all touring productions including commercial ones. The Arts Council’s dataset includes both UK and international touring. The second table shows the number of tours and the number of performances internationally. While 88% of tours and 97% of recorded performances took place in the UK, that still leaves 15,522 performances of 1,270 touring productions that visited 71 countries around the world. Whether it’s because of our special relationship or common language, the US clearly leads the way as the most popular destination for tours by funded organisations from England. The rest of the top 10 destinations (ranked by number of tours) are European except China. Although the Netherlands is ranked only at seven for the number of tours, it hosts the fourth largest number of English performances. 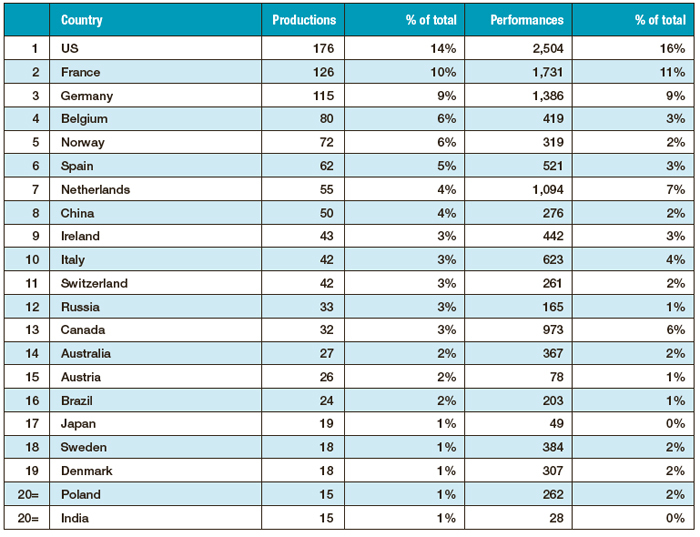 Similarly, despite sitting outside the top 10 by number of productions, Canada hosted almost 1,000 performances, placing it fifth in the ranking for performances.